A U.S. service member was killed and another wounded Saturday in an apparent insider attack in Kabul, the latest victims in a string of “green-on-blue” attacks against the U.S.-led military coalition in Afghanistan. “Initial reports indicate the attacker was a member of the Afghan National Defense and Security Forces,” Operation Resolute Support, the NATO training mission in Afghanistan, said in a statement. “The attacker was immediately killed by other Afghan forces,” the statement added. The two U.S. service members were transported to Bagram Airfield, NATO officials said. The wounded service member is receiving medical treatment and is currently in stable condition. NATO officials did not release the names or ranks of the American service members, pending notification to next of kin. The attack occurred at the Kabul Military Training Center early Saturday afternoon, Stars and Stripes reported, citing Nasrat Rahimi, deputy spokesman for the Afghan Ministry of Interior. Saturday’s attack was the fourth time in five months that a NATO service member has been killed in a green-on-blue incident in Afghanistan. It comes just two weeks after an Afghan soldier opened fire on Czech troops in Herat province, killing one and wounding two others. Before the Herat incident, two American troops were killed in insider attacks in July and September. 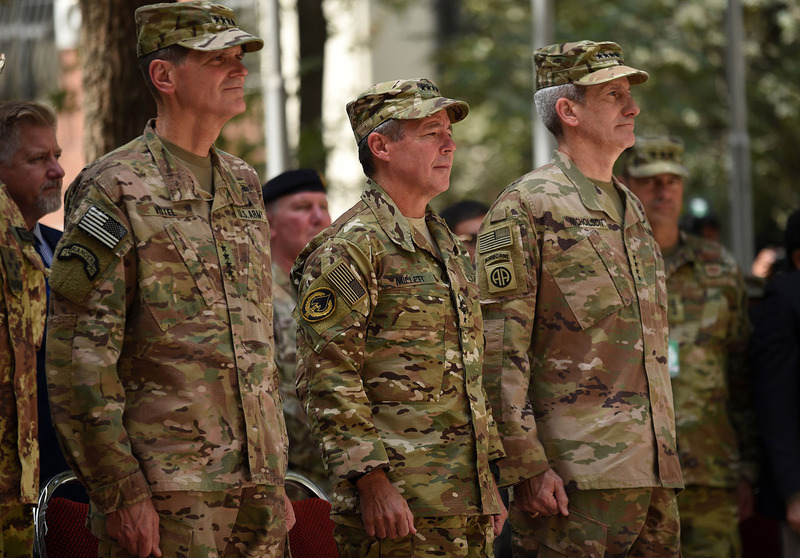 Present at the meeting were U.S. Army Gen. Austin “Scott” Miller, the commander of U.S. Forces Afghanistan, and Army Brigadier Gen. Jeffrey D. Smiley, the head of Resolute Support’s train-and-advise mission in southern Afghanistan. Miller was unhurt in the attack, but Smiley suffered a gunshot wound. The Taliban claimed responsibility for the attack, saying it had targeted the top provincial officials and U.S. commanders alike. NATO officials downplayed the claim that Miller was a primary target, but the idea that such a high-level meeting was infiltrated by a Taliban attacker has added to overall concerns about the deteriorating security environment in Afghanistan. Insider attacks against U.S. troops have declined from their peak in 2012 thanks to enhanced vetting of Afghan security forces and revised security procedures at military facilities. However, they remain a significant threat to Afghan troops — there have been 56 reported “green-on-green” attacks among Afghan forces this year that have left 121 dead and wounded, Stars and Striped reported.